New Delhi, May 10: Havana Club rum and the Havana cigar have long been the bridge between revolutionary fervour and gentlemanly refinement. Now they are going to drive contact between India and Cuba. Cuba’s post-Fidel Castro government wants the Havana Club rum bottled in India for the first time, and is sending a team to talk about it — perhaps over a few bottles of the liquid. If the deal is done, Indians can hope for cheaper Cuban rum. The 19-member Cuban mission, which arrives on May 17 on an 11-day visit, will also be trying to push India’s import of the famed Havana cigar, which at well over Rs 1,000 a stick is becoming a craze in Indian high society. Although business is high on the agenda of the team — headed by the deputy minister for foreign trade, Eduardo Escandell Amador — no memorandum of understanding is likely to be signed with the Indian government. Amador will be calling on commerce minister Kamal Nath, agriculture minister Sharad Pawar and junior foreign minister Anand Sharma, but it’s the Indian private sector he is interested in. “Now the Havana Club rum will be bottled from India and it’s going to be one among the many important developments of this visit,” Nidia Banos Ojeda, the first secretary (trade, economic and scientific co-operation) at the Cuban embassy, told The Telegraph. The Havana Club brand, established by Jose Arechabala in 1878, was nationalised after the Cuban revolution. But since 1993 the rum has been produced by Havana Club International, a 50:50 joint venture between French company Pernod Ricard and the Cuban government. Pernod now sells many famed liquor brands in India, including the Glenlivet and Chivas Regal. The Havana Club rum brands, which are not sold in the US, include Havana Club Añejo Blanco, Havana Club Añejo 3 Años, Havana Club Añejo Especial, Havana Club Añejo 7 Años, Havana Club Añejo Reserva, Havana Club Cuban Barrel Proof and Havana Club Máximo Extra Añejo. The team will also meet the two big names in the Havana cigar industry in India: Chetan Seth and K.K. Modi. 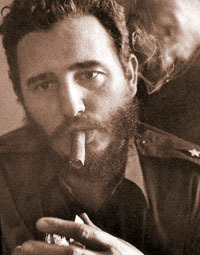 Seth has been the dealer for hand-made Cuban cigars in India for some time now. “Although Cuban cigars are available in India, the delegation will be meeting these two… so that the co-operation in the area can go up,” Ojeda said. The Indian Left generally frowns on drinking but smoking is not taboo, although the comrades once used to pride themselves on their love of cheap brands. Except for the late Pramod Dasgupta, there is no known cigar smoker in the country’s communist pantheon unlike the Latin American revolutionary hall-of-famers such as Che Guevara and Fidel Castro. The Cuban delegation, the first to India since Castro stepped down, will also meet top officials of the Tatas, Reliance and Maruti. The team will be looking at co-operation in power transmission, transport, textile products, refrigeration components and new technology for Cuba’s famous sugar industry. “This is the biggest trade delegation since 1980,” Ojeda said. The current bilateral trade between the two countries is only $30 million, a 10th of what it was in the early 1980s before the collapse of the Soviet Union.